Having studied Zoology early in my career, animals have always attracted me. 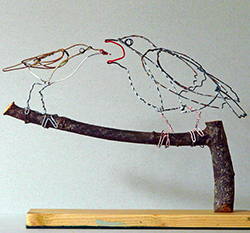 After retirement, I started making small animals out of galvanised wire, which are then painted with enamel paints. Each animal takes several hours to make. They are based on photos and drawings and the enjoyment of their creation comes from making them as realistic as possible with the minimum of lines. The most popular subjects are farm and domestic animals, particularly people’s pets but I also make a wide range of other mammals, many birds and also fish, frogs and reptiles. Commissions are undertaken from customers’ photos.